a narcotic, whether illegal or prescription such as an opioid, can so dramatically affect their family and co-workers. When he shared with the 70-plus attendees his own family’s sad experience with trying to cope with his sister’s addiction, you could have heard a pin drop in the room. Often the reason our judicial courts sever parental rights and release a child for legal adoption is because the biological parent cannot kick their drug addiction. And an addicted parent cannot provide a safe home for a child. But, if the child is not adoptable, then the child enters our questionable foster care environment. 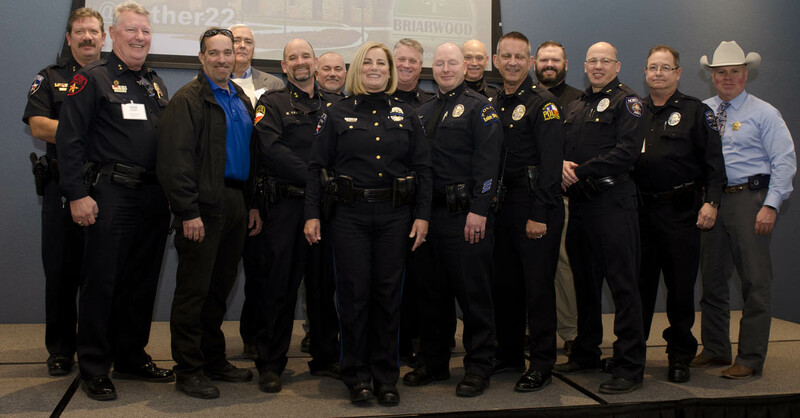 Over the years, Copper Canyon has tried to address at the luncheon some of the serious issues that precede or accelerate criminal activity in Denton County. For instance, human trafficking. One year we learned that North Texas is a regular distribution hub for other states. And when major sports events are hosted in North Texas, such as the Super Bowl, criminals just import more victims to serve the increased demand. We have also addressed the social issue of homeless teens in Denton County and discovered that no town in our County is immune to this critical issue. Our sincere thanks to Sheriff Tracy Murphree and his Chief Deputy Larry Kish for making Captain Jeff Davis available for the presentation. The CoServ Board and their Volunteer Cooks Provide Delicious Brisket! Richard Muir, CoServ Board Member District #1, welcomed all the luncheon guests for his fellow Board Members present: Clint Bledsoe (District #4), Bill Ragsdale (District #6), and Curtis Talley (District #7). CoServ representatives present to also welcome luncheon guests were Tracee Elrod (Copper Canyon’s Area Manager and on Hickory Creek’s City Council), Lauren Baccus, Jennifer Ebert, Vicki Sargent and Alphonso Williams. Dawn Cobb, as usual, took many memorable photos. A CoServ employee converted a flatbed trailer into a fantastic mobile kitchen! Luncheon guests just raved about the brisket cooked on the grill of the mobile kitchen! And the delicious assorted desserts of cake and cheesecake. Sharon Mersiovski; and to our Town Secretary Sheila Morales for warmly welcoming everyone; and to our Municipal Court Clerk Ann Horner for updating our “very easy to read” large nametags and for ”holding down the fort” at Copper Canyon’s Town Hall while the rest of our staff enjoyed being present at the Luncheon! And our sincere thanks to the Mayors, Police Chiefs, and County Officials who took the time to attend: Mayors Donald Moser (Argyle), Janet Meyers (Aubrey), Sue Tejml (Copper Canyon), Bill Heidemann (Corinth), Steve Smith (Cross Roads), Chris Watts (Denton), Mike Donnelly (Double Oak), Lynn Clark (Hickory Creek), Charlotte Wilcox (Highland Village), and Michael Barnhart (Lake Dallas). Police Chiefs attending were: William Tackett (Argyle), Bobby Dowell (Bartonville), Rex Redden and Derek Miller (Carrollton), Debra Walthall (Corinth), James Edland (Cross Roads and Krugerville), Lee Howell (Denton), Derrick Watson (Double Oak), Andy Kancel (Flower Mound), Carey Dunn (Hickory Creek), Doug Reim (Highland Village), Daniel Corolla (Lake Dallas), Russ Kerbow and Kevin Deaver (Lewisville), Robert Crawford (Northlake), Patrick Arata (Trophy Club). Denton County Officials attending: Andy Eads (Precinct #4 Commissioner), Jody Gonzalez (Fire Marshal), Tracy Murphree (Sheriff), Larry Kish (Deputy Chief), “Hino” Hinojosa (Public Relations), Dewayne Dockery (Chief), Barry Carver (Asst. Chief), Eric Peterson (Media Relations), and Copper Canyon’s three Dedicated Deputies Maurice Floyd, Gilbert Velo, and Richard Young. Denco 911 Officials: Mark Payne (Executive Director), Greg Ballantine (Deputy Exec. Director), and Board Members: Sue Tejml (Vice Chair), Jim Carter (Municipal Representative), Bill Lawrence (Commissioners Court Representative). Lantana Officials: Kevin Mercer (General Manager), Max Miller (Lantana FWSD #6 Board), Dr. Andrew Kloser (Lantana FWSD #7 Board). Canyon Oaks HOA: Jean Campbell. (LISD Security Director), Michael Leonard (Liberty Christian Campus Monitor). 7 a.m. to 7 p.m. Double Oak Town Hall is the closest polling place for Copper Canyon voters, but only on Election Day March 6th. Early Voting for County Officials is Tuesday, Feb. 20th through Friday, Mar. 2nd. The closest early voting polling places for Copper Canyon voters are the Highland Village Municipal Complex and the Flower Mound Police and Municipal Court building. Tuesday, Feb. 20, through Friday, Feb. 23, early voting is from 8 a.m. to 5 p.m. Saturday, Feb. 24, early voting is 7 a.m. to 7 p.m. Sunday, Feb. 25, early voting is from 1 to 6 p.m. Monday, Feb.26, through Friday Mar. 2nd early voting is from 7 a.m. to 7 p.m.
Copper Canyon has two voting precincts. The north part of Town is Precinct 4019. The south part of town from the Woodlands is Precinct 4020. You can find your precinct number by your name and birthdate or Voter Registration Identity Number on www.voteDenton.com. The County Judge is the presiding officer of the Denton County Commissioners Court. The Judge is not required to be an attorney, and the Commissioners Court is an administrative body, not a judicial one. The Commissioners Court consists of five voting members. The County Judge is elected by all of Denton County voters. The four County Commissioners each represent one of the four geographical precincts in Denton County. Each County Commissioner is elected by only the voters in their respective Precinct – #1, #2, #3, or #4. The following municipalities are in Denton County Precinct #4: Argyle, Bartonville, Copper Canyon, western Denton, Dish, Double Oak, Draper, western Flower Mound, Justin, Krum, Northlake, Ponder, Roanoke, Trophy Club, and the Denton County part of Haslett, Southlake, and Westlake. Also included from the unincorporated area of Denton County are Lantana’s Fresh Water Supply Districts #6 and #7 and Canyon Oaks subdivision. Republican: Andy Eads, our current Denton County Precinct #4 Commissioner, is the only Republican in the race for County Judge. Eads lives in Flower Mound and has served as County Commissioner of Precinct #4 for three terms or for the past 12 years. He will face the winner of the March 6th Democratic primary in the November 6th General Election. Democrat: Willie Hudspeth and Diana Leggett, both residents of Denton. If no candidate receives over 50 percent of the vote in the political party primaries, the two candidates with the highest votes will have a run-off election on Tuesday May 22nd. Position #1 – Steve Hill has served on Council for 15 years and has filed an application to be re-elected to his current Position #1. 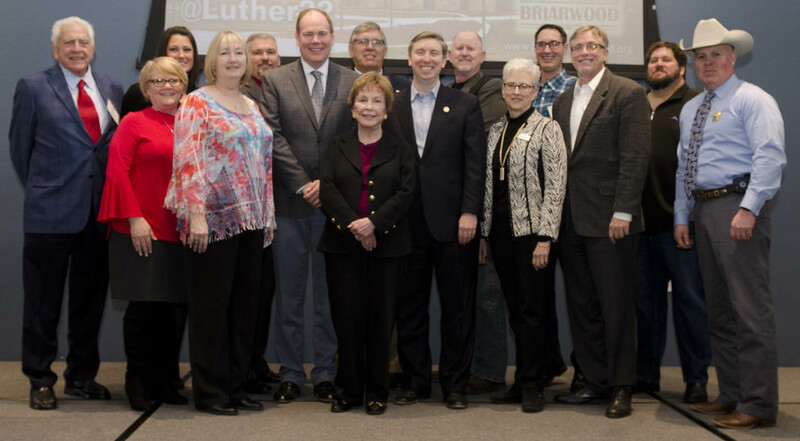 Steve was elected Mayor Pro Tem by his fellow Council Members for six years. He then voluntarily relinquished that position and graciously nominated our longest serving Council Member Jeff Mangum (19 years) to be Mayor Pro Tem. Mangum reciprocated and nominated Steve to serve as Deputy Mayor Pro Tem. Steve retained that title until last year, when Council Member Dave Svatik nominated Council Member Valerie Cannaday for the position, due to Steve’s absences from some Council Meetings with his international business travel schedule. Valerie’s fellow Council Members, including Steve, unanimously approved her for the Deputy Mayor Pro Tem position. Steve served as the Chairman of the original Master Plan Committee in 2004. The Master Plan was the original brain child of former Mayor Larry Johnson, former Mayor Pro Tem Joe Chiles, and Steve. Prior to our Comprehensive Master Plan, Copper Canyon just grew with no real direction or complete building construction standards. Steve has also been the Town’s Financial Officer for over a decade. He ensures that the Town funds and property taxes, which are deposited in a local financial depository, are adequately covered by surplus collateral. He is also required by the State to complete educational courses that keep his knowledge as Financial Officer up-to-date. Steve also created our Pro Forma Budget. The Pro Forma is an invaluable tool! Steve worked for months in 2005 with myself and our former Town Administrator Paulette Hartman. We reviewed the financial history of every line item in the Town’s budget and estimated the future increase of each expense and revenue item. Steve is Global Head of Innovation for KPMG, one of the four largest international accounting firms. In his spare time, he enjoys racing Ferraris all over the United States. He also teaches high performance driving skills in his free time. Steve lives on Copper Woods Drive on 10 beautiful acres! Position #3 – Valerie Pearson Cannaday has filed to serve a 3rd two year term on Council. She initially served on the 2009 Long Range Planning Taskforce. Valerie drove every road in Town to better understand the need for a bond election to rebuild our deteriorating 24 to 35 year old asphalt interior residential roads. Valerie also supports and contributes to the college scholarship fund for Copper Canyon high school seniors. Her husband Michael Cannaday is a builder for Precision Builders in Copper Canyon. Michael has built luxury homes on multi acre lots in Hidden Creek and will build in the new subdivision Copper Creek on the west side of Copper Canyon Road (the prior 42 acre site of Camp Summit.) Michael has been dedicated in saving many of the beautiful mature trees to enhance the new home sites there. Valerie and Michael live east off of Copper Canyon Rd. Position #5 – Bill Castleman has also filed to serve a 3rd term on Council. Bill served on the Master Plan Committee in 2004. He recently undertook the coordination of the Town’s Emergency Responses with Denton County and our Argyle Fire District. As a professional photographer, Bill has kindly volunteered to take gratis photographs of Town Events: The Denton County Mayors Crime Prevention Luncheon in January, Copper Canyon’s College Scholarship Winners in April, our annual July 4th Parade, and our Santa Party for Copper Canyon Kids. Bill has also used his skills as a drone pilot to aerially video Chinn Chapel to identify blind spots for motorists due to the road’s bends and vertical rises. His aerial videos were a tremendous help to our Halff engineers in safely designing the rebuilding of Chinn Chapel. Bill and his wife Lynne moved to Copper Canyon in 1983. They live on acreage on Lonesome Dove Lane, west off of Jernigan Rd. Bill is a licensed instructor in handguns and often teaches military and law enforcement officers. Bill reviews our signs at Town Hall to be sure they comply with the State’s firearms legislation. “Lots of Record” are lots platted prior to Copper Canyon’s incorporation as a Town in 1973. Lots on Chinn Chapel Road, north of the railroad tracks and south of the Poindexter Creek Bridge, were platted before Copper Canyon was incorporated in 1973 as a Town. Some of them remain single half acre lots, but most of the half acre lots are now combined into multi-acre residential home sites. When the Town adopted the Master Plan in 2004, it overlaid that area on Chinn Chapel with a minimum two-acre zoning per residential home site. Norman and Sherly Long lived in a rock home on 3.5 acres at 648 Chinn Chapel. In 1987 the Longs deeded one acre by metes and bounds of the 3.5 acres to a relative, so that he could use the acre as collateral to borrow money to pay off a mechanics lien. However, the Longs continued to treat the one acre as part of the total 3.5 acre home site. They never approached the Town to have the one acre platted into a home site. The fence around the perimeter of the 3.5 acres remained the same. The only access to the one acre was from the Longs’ driveway to their rock home. The septic field for the home continued to lie partially under the one-acre lot deeded to the relative. If the grass was mowed, the entire 3.5 acres was mowed. If not, the entire 3.5 acres was overgrown and often unkempt. The only way you could know that the one acre, fronting on Chinn Chapel Road, was separately owned was by the deed from the Longs to the relative and the fact that the relative paid the minimal property taxes on the one acre. In 2006 Shirly Long wanted to build a second home on the 2.5 acre site for a grandson. However, Town zoning required 4 acres to accommodate a second home. So, instead Shirly Long renovated her existing home to accommodate the grandson and his family. In 2016 both Norman and Shirly Long were deceased and the rock home and out buildings were dilapidated. The two parcels of land (2.5 acres and the home and 1.0 acre of unimproved grass land) went into foreclosure by two separate financial institutions. Eric and Missy Rooney Purchase and Renovate the Rock Home and 2.5 acres. A year ago Eric and Missy Rooney purchased the 2.5 acres and renovated the rock home. The Rooneys said their vision was for an open, natural area to raise their five small sons. The Rooneys hoped to also purchase the one acre grassed tract, but couldn’t initially afford the extra expense while they were paying for the extensive renovation of the rock home for their family. Trail Chairman Deb Valencia was surprised to see Eric Rooney and all five of his small sons show up to help with the Town’s annual Trail Clean Up. (Deb said the youngest Rooney son was on his Dad’s back in a backpack!) But Eric and his four older sons picked up litter and moved small rocks off the trail that horses might stumble on. In 2016 and 2017 David Andrews, owner of Century Custom Homes, began negotiating to purchase residential lots in Copper Canyon. He negotiated to build a future home for Town resident Holly Frenzel on her 6 acres fronting on Orchid Hill. Andrews also purchased Frenzel’s rear 6 acres that fronted on the cul-de-sac on Mobile Drive. The Town Council approved his plat to extend Mobile Drive and build 4,000 square foot plus luxury homes there on six one-acre home sites. Andrews also purchased a half acre on the east side of Chinn Chapel at auction and built what he styled a “country cottage.” He then bought a half acre site on the west side of Chinn Chapel just north of the railroad tracks and built an identical “country cottage” at the request of the new homeowners. He also purchased an acre site on the east side of Chinn Chapel and began building a large custom home. Mr. Mathews petition was heard by our P & Z Commission at their joint meeting with Council in December. Our P&Z unanimously denied the petition to change the Master Plan and thence change the minimal residential zoning for that Chinn Chapel area. The Council decided to postpone their decision on the issues until the January Council Meeting. Copper Canyon Residents unite in Rejection of Changing the Master Plan and subsequently allowing Residential Lots smaller than Two Acres on Chinn Chapel. 109 Town Residents Sign an online Petition to that Effect! Prior to the January Council Meeting, Eric Rooney had posted an online Petition asking Copper Canyon residents to oppose David Andrews’ proposed change to the Town’s Master Plan allowing smaller residential lots in that area of Chinn Chapel. An incredible 109 Copper Canyon residents signed that Petition! An equally incredible 65 people signed the attendance sheet at the January 12th Council Meeting. (60 of the 65 signatures were from Copper Canyon residents.) Our Council Chambers were literally packed and all folding chairs were in use. Fifteen Copper Canyon Residents spoke at Public Input. They ALL Recommended that the Council NOT change the 2004 Master Plan! Personally, I was very proud of the sincerity and restraint of the fifteen Copper Canyon residents who spoke at Public Input. This could have been a very disruptive meeting! But it wasn’t. However, the audience warmly applauded after each Copper Canyon resident spoke. I was especially impressed by the analysis of two residents. Attorney George Bleuher lives in the Woodlands and manages his wife Dr. Denise Doolittle’s veterinary medicine practice. Bleuher said this was essentially a legal “Failure of Title.” Either (1) the Builder did not do “due diligence” prior to his purchase of the one acre unplatted lot; or (2) the Builder did do his “due diligence” prior to purchase, but counted on persuading the Council to change the Master Plan and subsequently reduce the minimum residential lot zoning from 2 acres to 1 acre in this area. A favorable Council decision would allow the builder to build a home on the one acre in front of the Rooneys’ rock home on Chinn Chapel. The Council Members obviously listened to the comments of the Town Residents, and Most of the Council Members Understood their Concern. Because our Planning and Zoning Commission had unanimously rejected the Builder’s proposed change to the 2004 Master Plan, the Council would have to have a “super majority” vote of a minimum of FOUR Council Members to override P&Z’s recommendation and approve the Builder’s petition to change the Master Plan. Instead, the Council voted unanimously to concur with P&Z’s decision and deny the Builder’s petition to change the 2004 Master Plan and subsequently the residential minimum lot zoning in this area of Chinn Chapel. In the week after the January Council Meeting, I called almost all of the 60 Town residents who had attended the Council Meeting. Three things were obvious. First, the Town residents understood that the reduction in buildable lot size to one acre was a onetime occurrence specific to this one-acre lot. And second, they were looking at the “big picture” and considered this one-time reduction in residential lot size a bad policy decision for the future. And third, they felt that the majority of Council Members had “listened” to them, understood their concerns, and responded appropriately by denying the builder’s request to reduce the minimum residential lot size to one acre. These half-acre platted “Lots of Record” are still grandfathered as buildable home sites, as they were platted prior to the Town’s incorporation in 1973. But, at least two homeowners, on multiple acre homesites consisting of several platted half-acre “lots of record”, have said that they will voluntarily assume the expense of replatting their smaller half-acre lots into larger multi-acre residential parcels. These homeowners are to be commended for taking the initiative to solve a possible future problem for Copper Canyon. Sue Tejml is mayor of Copper Canyon, TX.